That's a pretty intriguing title isn't it - what is the best way to communicate with parents? Unfortunately, you're probably not going to like my answer; there isn't one best way to communicate with parents. What worked for you last year might not work this year and that's because each group of parents is very different. That doesn't mean that you have to use your precious time covering all of the possible means of communication. When I realized how much time I was spending on parent communication (newsletters, notes home, emails, phone calls, and posted messages in the classroom) I started something that made my job a million times easier - I put together a communication survey. I asked parents which ways they preferred for me to communicate with them. Only give them options that you are willing to use such as a note sent home, emails, texts, updates to the class website. If you don't want to call every single parent on the phone, then don't make that an option they could choose. I also asked where they were most likely to see important information. Some of my options included reminders posted in the classroom, on their phone (anything digital, such as an email, private Facebook group, text reminders, etc. ), or in their child's backpack or take home folder. Once you have the survey use a variety of communication reminders to make sure that all of your parents see it - email it to them, send home a hard copy, post a reminder in the classroom letting them know where they can find it and when to turn it in, and send a text or digital reminder letting them know when to turn it in. Once you have the results it should be easy to see where you need to focus your communication efforts. 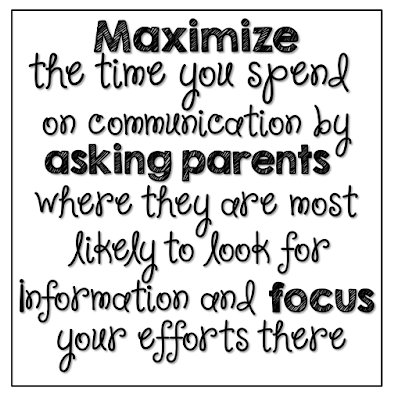 If your parents are most likely to pay attention to notes sent home, set up a system - like all of the important communication will be printed on a certain color of paper - and let parents know about it. If your parents are most likely to respond to emails make sure that you have all of their emails, and that you have a system in place for families that don't have email or Internet access. If your parents are most likely to respond to text messages find an app like Remind that will help you manage this. 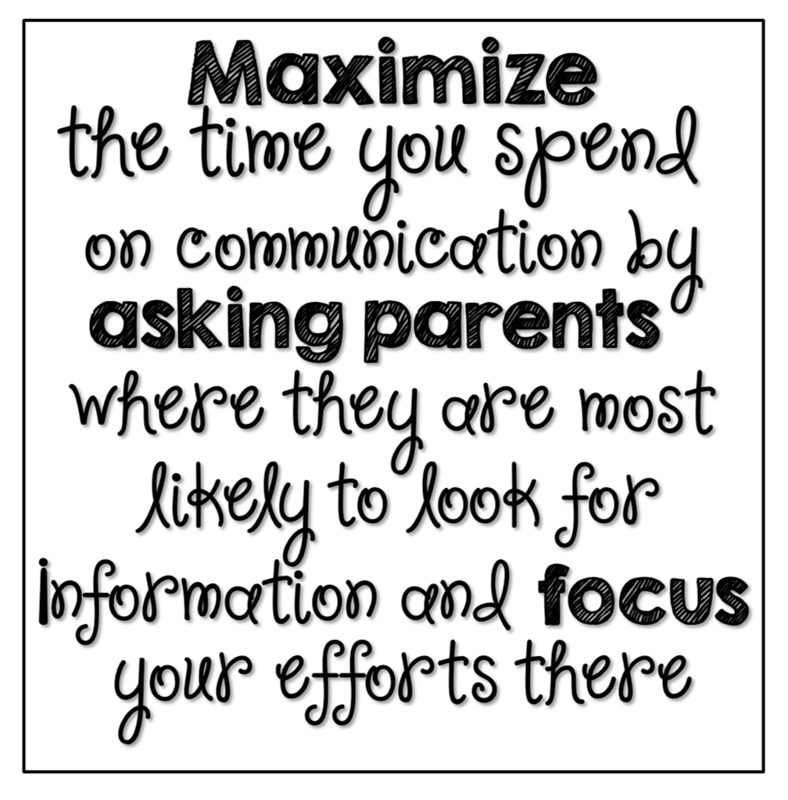 Once everyone knows what the system will be stick to it, there may be an adjustment period, but if you are consistent with your means of communication then your parents will be more likely to get your messages because they will know where to look for them. You will then have more time to spend on all of those other teacher tasks. If you are looking for some websites that might help you communicate with families, check out my Tech Resources E-Book (a freebie!) for some ideas on blogging, using Facebook, and creating classroom websites.